Next week leaders from business, government and civil society will meet in Davos, Switzerland as they do each year for the World Economic Forum's annual meeting. 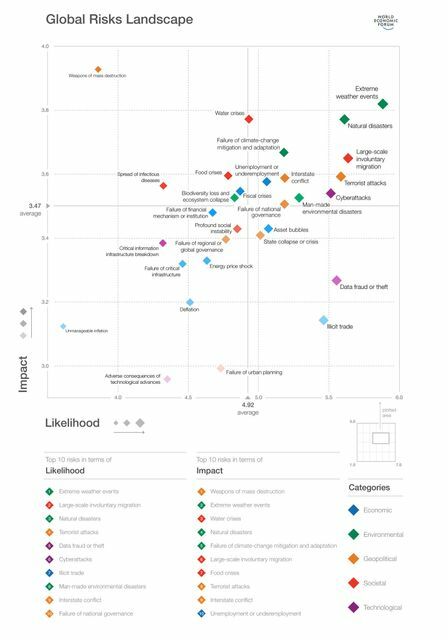 One of the highlights of that meeting (and a big part of the agenda) is the 2017 Global Risks Report, which examines the threats emerging from an increasingly connected, complex and rapidly changing world. A short blog post below and a link above is worth perusing as we look at the coming weeks and months, and friend/colleague Barri Rafferty from Ketchum will be sharing insights from Davos all week - follow @KetchumPR on Twitter for regular updates. These tumultuous times can present us with ground-breaking opportunities for changing how we see the world, and how we operate within it. Such change, however, brings with it significant globally interconnected risks, risks which must be factored into modern life.